This video shows the basics of setting up and running the Proposal Pack Wizard software. This video follows the 5 Minute Quick Start PDF manual. See how to set your visual design theme, create a project, select a set of templates using the premade import lists and samples, generate a document and get it opened and edited for final delivery. This video is going to cover the 5-Minute Quick Start of the Proposal Pack Wizard Software. The Wizard is a Word for Windows Add-in so it only runs on Microsoft Windows and Word for Windows. If you are a Mac user refer to the other video 5-Minute Quick Start for the Proposal Pack. So we're going to start assuming that you've just placed an order. 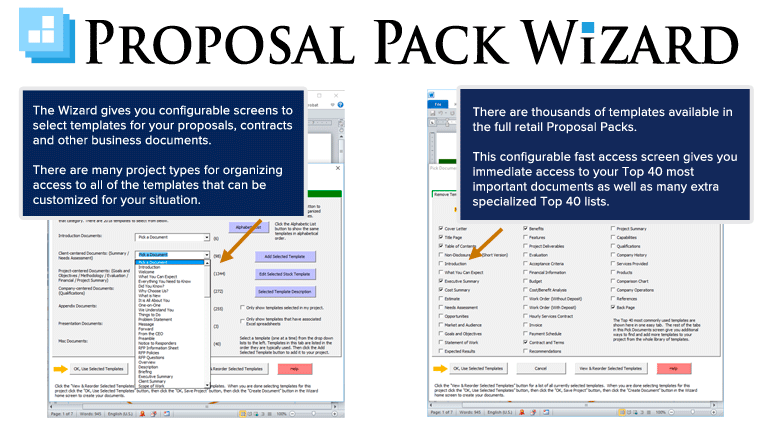 Most people are going to order either the Proposal Kit Professional, a single Proposal Pack, maybe two Proposal Packs or a combination of the Proposal Kit Professional and a Pack. So we're going to start with a Pro Kit and two Proposal Packs installed. Whatever products you've purchased and downloaded and installed you'll see these icons on your desktop. So we've assumed we've placed an order, we've logged in, downloaded the Packs and now we've downloaded the Wizard software. We're going to start from a clean install of the Wizard, so run the Wizard installer. And you'll see this is the Expert Edition. The Expert Edition comes with the Proposal Kit Professional and you can get it as an upgrade if you got the Novice Edition with a single Proposal Pack. The Quick Start instructions will cover both editions. Click through the next buttons, wait for the installer to copy all the documents to your computer. Towards the end of the install it will open a Word document and you'll see some pop-up instructions. Just follow those and you'll also pop open your 5-minute Quick Start PDF. This video is going to follow along the steps in this PDF so we'll just close that for now. Now the installer will open the Wizard's Word document. The Wizard program is actually embedded inside of this Word document so this Word document will always be open when we're running the Wizard. During the initial install and usually when you open it afterwards you'll see some yellow bars across the top. With Word 2013 to 2016 the Marked as Final - just ignore that - do not click the Edit Anyway button. The signatures line, that's normal. The Security Warning is the important button. You'll see a Security Warning - Macros Have Been Disabled with an Enable Content button. All you have to do is click the enable content button. Once you do it will disappear and that covers the setup step for enabling the macros. You can scroll down this Word document and see the instructions for Word 2007. There you may see an Options button. Once you click that you will see a radio button saying Trust all Documents from this Publisher. Check that, click OK button and that will enable the macros in that version of Word. Now that we've enabled macros there are two ways to run the Wizard. We can close this document and then just double click this Run Proposal Pack Wizard icon on the desktop each time you want to run the Wizard. With the document already open during the install we can just click this Add-ins tab and then click the Run Wizard button. You'll see it initializing the Wizard. The first time you ever run the Wizard you will see the setup screen. There are four tabs on the screen. This first screen, Company Information, just type in your name address contact information. You can always change it later as well. There's also a tab how to write your documents. Answering these questions will just tailor the interface a little bit. It doesn't really matter how you answer these. If you're not sure just click the 'Other' option. Your starting project number you can leave that as 1. The types of documents, General Business Proposal is the most common. You can leave it at that. Changing the proposal types, a business plan, research proposal, resume. That will just tailor the interface a little differently. For now, just keep it as General Business Proposal for the most part. Same with these other questions. The length. The other tab is for your logo. You can always set the logo later and there'll be another video on how to integrate your logo if you have the appropriately sized graphic. You can just browse to your logo here and set this. This is also available in the preferences settings later. The last tab, the Activation Code. You'll find your Activation Code in the email that was sent to you after you place your order. If you find your email look under the link past the username and login password and you'll find an Activation Code down here. You're going to copy that with your mouse and to paste it in use CTRL-V with your keyboard or just type it manually. If you don't have your email you can get your Activation Code by going to our website ProposalKit.com. Click the My Orders link in the header, enter your order information and it will look up your past order information and give you a new Activation Code. Once you've looked at all four tabs and if you miss looking at one you'll see an orange arrow pointing to the tab you did not look at yet. You do not have to fill in every screen but at least look at the four tabs before continuing. Now that we've finished the setup screen, click OK.
Now the Wizard will finish initializing itself. This is the Wizard Home Screen. Whenever you see references to the Home Screen it is this screen with the four numbered buttons, 1, 2, 3, 4. This is the interface you'll use to create each new custom document so the first thing we can do is look at the document styles. Now if you only purchased a single Proposal Pack you will only have one style to choose from and that style will already be set as your current style which you'll see right here. If you purchased the Proposal Kit Professional you'll have at least four styles to pick from. So click the Document Styles button. Okay, so now that we have all of our purchased styles in the list you'll see those at the top. The four that came with the Pro Kit and our two add-on designs. All of our hundreds of other Proposal Pack designs are available in the Wizard interface and they'll be in this drop down list. And you can purchase those with your discount by highlighting any one of these and going to one of these links. For this demo we're going to use the Contemporary #1 design theme. It's got a nice little color and design graphic to it. Once we've set our style click OK and note if you only had one design style purchased you don't have to go through this button. It'll already be automatically selected. So now you see our design theme we picked is now set as our current style. So the next thing is the Document Projects button. Every time we're going to create a new document say a proposal, business plan, or report, study, RFP, grant, any document. You go to button #1 to Document Projects. Now the Wizard will show you some tutorials the first time you run it. Just click through those. If you do not want to see these tutorials again check the box, close the window. Now we're on the Project Data screen so type in the name of your project. This name is for your information only. It's not put into the document anywhere. A lot of times people will use their customer's name here so they can keep track of the project folders. You'll see a number of options, most people are just going to leave the default settings. Now the most important button here is the Pick Documents. Click the Pick Documents button. Now the Pick Documents button, this will take you to a screen that has a number of tabs. All these tabs are different ways of getting chapters into your project for the document you're going to build. So I'll start with the Quick Start tab. Now there are hundreds of pre-made lists of chapters for all different kinds of proposal situations. So using a Quick Start list is a great way to get a set of chapters in your project quickly. You can use the drop-down and just scroll down in alphabetical order. If you see we get down to say the s's you'll see a whole bunch for security. For example, what if we wanted to narrow this list of hundreds down to just the one we want. Well we can use this Search Import Lists button and let's say let's find all import lists for security. Maybe we want to start a security guard services proposal. That'll narrow the list down, but you know security can be a topic within many proposals. So you'll find items in the list beyond just what's alphabetically labelled as security. And same thing with say real estate. Let's find a quick start list for a real estate proposal. Let's pick the Real Estate Land Development. Okay once we've highlighted any of the items in the quick start list it'll give you some general information and a list of the chapters that will be loaded for that proposal. Once we've picked one we can import the list into our project and now you'll see all the chapters selected for this proposal. We can reorder some. Maybe we want to move this chapter down, maybe move another one up in the list. Now the Cover Letter, Title Page and Back Page all have to stay in their locations at the top and bottom. Everything else you can move around. Now that we've selected a set of chapters you'll see how many we have selected. Basically this is going to be about the number of pages your proposal document is going to wind up being when it's generated. And note the Novice version of the Wizard is limited to a 10-page document. The Expert version has an unlimited number of pages you can use. You could build a document 2,000 pages long. Most proposals will be in the 5 to 10 page range so the Novice edition will actually work for most people so maybe we want to narrow this list of 19 down to 10 or less. Well you can use the Remove Templates tab. So we can remove some chapters say we don't need. We're actually going to remove more than just getting it down to ten, so we get it down to eight pages. But now maybe we want to add some additional chapters. The Add Templates screen gives you access to all the thousands of templates. This first screen will always be the Top 40 list. These are the top 40 most commonly used chapters and you'll see some are already checked off for our project. Since we're working on a real estate proposal maybe we're going to look at some more real estate related chapters. You can click this drop down and scroll down through a lot of different categories. These are just different groupings of chapters. We'll go to a real estate grouping of chapters let's say. Okay maybe we want to add the Site Planning. Now let's talk about Permits and Licenses. Well, we are up to ten pages now that's a good number for our Novice users. Another way you can find chapters is to use the Search by Name screen here. This is a good way to search for an individual chapter. Maybe we want to add a Policy page. Well, let's search for the word policy. This will do a search across all the thousands of chapters for anything that has the word policy or is related to a policy. Just scroll down. See everything is kind of related to that and you'll see there's a number of policy type chapters we could add. Or say what if you wanted a Mission Statement and maybe a Company History or an About Us. So you'll find the About Us and Mission Statement. To add any of these you just highlight them, click Add Selected Templates and now you'll see they're part of your list. Now let's look at the View Samples tab. The View Samples is another way of getting a lot of templates into your project for very specific situations. Proposal Kit includes hundreds of completed samples and those completed samples are made up of thousands of pages of filled in content. This tab will let you access all of that material. The samples are in rendered PDF documents since the samples are finished versions of other people's work that we include as just general guidelines and help material. To get to any of the samples you can click the drop down and just scroll alphabetically through the hundreds of included samples and find something by the title that is related to what you're looking for. You can also use the search samples button to narrow this list down. So let's say we're going to search for something that's security related. To search across all the titles and descriptions and template lists and give you a range of things that have security related aspects to them including ones that you'll see 'security' in the actual title. Let's say we're going to look for accounting. Whenever you find a sample that you want to look at click the View Selected Acrobat PDF Sample and it'll open the PDF for you to view. Now the Wizard will launch whatever your default PDF browser is on your computer and it also can open them up in say your Edge or Internet Explorer or other web browser. Now since these samples are rendered will always include in some help material at the beginning, the title, the list of actual chapters that were picked for that sample and the visual design theme. Now your design theme is going to be the one you actually purchased which will probably be different from design themes you see in the samples. Now you can recreate every one of these samples as an editable Word document in the visual design theme that you purchased. To do that we'll just close this PDF sample. You can click this Import Content from Selected Sample button. When you do this when you generate your document the Wizard will actually pull in the text from that sample and import it into your generated Word document in place of the stock fill in the blank material. So this is it how you can create an edible version of every one of our samples. This feature also works with the other tabs on the screen where you can then add additional chapter templates that may be things that you want in addition to what was in the sample. So you can create an editable version of a sample that has custom chapters and created in the visual design theme that you purchased. Now the Add a Contract tab, this is only for use if you have a legal Contract Pack or a Proposal Kit Professional installed. If you have either of those you'll have access to all of the contract documents that are in that package you purchased. You can scroll down here, add any of these as needed and add them to your project. Now the Title Page tab. This is best used if you're using our Proposal Pack for Any Business or the Proposal Pack for Government Grants design themes. Those are the design themes that start out plain and are easiest to customize the color scheme and design to match your own logo and colors. If you use this screen you can scroll through a number of preset color schemes and pick a design theme. Each Title Page Pack will have five designs each design in 120 color schemes to pick from. Since we're using the Contemporary #1 design theme that already has a custom color scheme and Title Page we're not going to use that here. Now at anytime you want to see what chapters you've selected and maybe even reorder them you can click this button View and Reorder Selected Templates. Any chapters you've selected will be in the list. This pane is reserved for templates you've added your project that are not combined into the master proposal. Those might be external checklists. And the Presets tab. This is for use when you've selected a set of chapters that you always want to use for your future documents for each new proposal if you're going to be writing many proposals. This screen you can create a preset will save your custom list of selected chapters and each time in the future you come back and add a new project you can simply come here to the Presets tab, select your preset, automatically load in this list of chapters you've taken the time to select this first time. When we are all done with selecting our chapters click the OK, Use Selected Templates button. That will take us back to the project screen. you'll see the number of chapters you've selected. And now we're ready to finish entering our company and client data which will be merged into the document. Click the Company Data screen. Whatever you typed in the initial setup screen when you first installed the wizard will be here. If you want to change any of these defaults you can click this button. Once you've finished entering your information click OK. The other button, Client Data will be used for entering your clients name and address information, a title for the proposal that will go on the Title Page. Ok, now that we filled this in for this particular client click OK. When you're all done picking your chapters and entering your data we're ready to generate the document. Click the OK Save Project and Build Documents button. Now the Wizard will ask you if you're ready. If you're not ready to actually build the document you can say No and then later, when you're ready you can either go back, edit the current project, click the Ok button again or click this Button #3 Create Document. So click Yes. Now the wizard is generating your document. It is taking all of the chapters you selected, appending them together, applying any custom design themes, applying custom color schemes. It's merging your name and address data and assembling a complete Word document. Make sure you do not interrupt the Wizard while this screen is processing. Because the Wizard is actually opening and closing many Word documents in the background, if you start clicking the Wizard screen or interfering with this process you can generate unexpected error messages if you cause Word to lose focus on the document its processing at the time. So just sit back and wait. Ok, now that the Wizard has generated the document you'll see this process complete screen with the checkmark. One thing we've recently added this year is timing results so you can see where the Wizard spent most of its time. These may give you some insights into how to optimize the document processing later. When you're ready to open your document just click the Ok button. Now the Wizard is going to open the documents it just generated. Now since we were using an Expert version this is showing one Expert level feature not available in the Novice Edition I will show you in a minute. But this is the Word document that was just generated. You'll see that the Cover Letter is filled in now. You also notice the actual text in this generated document is actually filled in. That is because when we picked that import list we actually picked an import list that was from an actual filled in sample proposal. So the document generation process pulled in the sample content into the generated document. If we'd picked a set of chapters that was not related to an actual sample this would be more of a fill in the blank instructional Cover Letter. But you'll see the name and address information from the Client Data screen entered here. Our Company Data entered in the bottom. The design theme for the Contemporary #1 design in the Title Page. The proposal title we gave it in the Client Data screen. The name and address information, the Company Data information, proposal number. The Wizard generated a Word document Table of Contents. This is an actual TOC object. A Word Table of Contents object. So say as we are editing our final version of this proposal and our page numbering changes. You can always update the page numbering simply by right-clicking the Table of Contents object and updating the field. Now you'll see some elements from the Contemporary #1 design theme. So depending on the design theme you purchased, things like this color and design and font type of the chapter headers, the watermark image embedded in the background, the footer graphics, the bullet point graphics, the colors in the table cells will be different depending on the Proposal Pack you purchased and also depending on what customizations you made say using the color scheme and font changes or the Title Page Pack options will all affect the visual look of how your document is generated. Now let's look at the Expert level feature that was used in this process. You see in the Cost Summary that there's actually line items and prices and totals already calculated in this generated document. These are again from using the Quick Start list that imported the contents of one of the actual samples that had some data already defined for it. Now you see when I click these, the entire item lights up. It's not just plain text these are actual OLE dynamic links between cells in the Excel spreadsheets and this Word document. So if I look at this Cost Summary Calculator spreadsheet you'll see these items and these prices match up with these line items and amounts in the spreadsheet. So the actual data is in the Excel spreadsheet and it's only linked over into the Word document. So if I change the data in the spreadsheet and cause calculations to change they will reflect back in this Word document. I'll show you how to do that really quick. The easiest way is to close your Word document. So now we still have the Wizard open in the background. We've closed the Word document and we only have the Excel spreadsheet for the Cost Summary opened. So let's change some of these prices. We'll change this to 76. You'll see the total changes to 792. We'll save our changes to the spreadsheet. Now let's go reopen the Word document. Now we are in the Edit Screen. I'm going to close the Edit Screen just so you can see how to get into it. Back on the Wizard Home Screen. So now that we've created a project and generated its documents that is our current project. You'll see the current project is this one right here. We've already created the documents so now every time I want to edit this particular project and its documents I'm just going to go to button for Edit Current Document. It's going to reopen the document that was generated last time. Now because this is using an Expert level feature with the dynamically linked Excel spreadsheets, whenever I open this Word document it's going to ask if I want to update the document from the dynamic links. Say Yes. You'll see the Word document kind of updating itself. And now if we go back and look at the Cost Summary you'll see our 56 changed to 76 and our 792 is updated in the Word document. This uses Microsoft's OLE linking, it's a standard feature of Microsoft Word so the Wizard just makes use of these standard features when it builds its documents. So when you're doing these things, editing your spreadsheet, saving and opening and updating a document. These aren't features inclusive to our Wizard or our templates. We're just making use of standard Word features for you but this is how our dynamic linking feature works. You can edit calculations in Excel spreadsheets. Now these spreadsheets aren't something you're normally going to want to show as is to your customer, so that's why we link only the cells we want into the Word documents so that the final version we show our clients is a lot more professionally formatted. Now you'll see that we linked all of the line items so what we want to do in our final version for all the unused line items, we can just highlight and delete these unused links. So this is now just getting into standard word processing as you clean up this document getting it ready to send your client. So just make your edits to this spreadsheet, edits to the documents, finish filling in everything and when you're done you're ready to save your document as a PDF to deliver to your client. Just close all these open screens. So the Wizard actually has a feature to do that. So say we have finished editing this document we can just, say, save as PDF. Click Yes, and we're just saving a PDF version. Now the PDF version will be uncoupled from the spreadsheet. Now, so all we have to do is send the PDF document to our client or print it and deliver it. Now I see a PDF version created and this is the final version we can send to a customer. You also notice that on your document edit screen you'll have access to open both the Word and the PDF versions. If you want to actually get to the folder where all the documents for this project are created you'll see the actual folder on your hard drive you can go to to get to the documents. A quick link straight to that folder is clicking this Open Project Folder button. That'll just take you to the folder on your hard drive and you'll see in this folder your proposal title will be the name of the folder. So every single document you create will have a folder within this proposal projects folder where all the files generated will be located. The combined document will always be FullProposal.doc. The PDF version we'll be FullProposal- with the project title attached to the end. All these individual pages you do not need to worry about. They are just combined together into the FullProposal. You've got your Excel spreadsheets if you're using the dynamic linking feature will also be here. The next time you create your next proposal you'll just see a new folder and all your past work will still be here. That pretty much covers the basics of using the Proposal Pack Wizard.